The problem is that the 2 uprights have been added before the other elements. as Polyboard works with a tree structured data base it’s the other elements that are dependant on them. A workaround would be to move both uprights to 0mm from the right and then set the side and first right upright to nil panels. this Will make the second from right upright the side. However, if I was you I’d cut this unit into at least 3 smaller elements. For the moment as well as being very cumbersome to build and install, you will have a problem getting the panels to make the back and bottom. 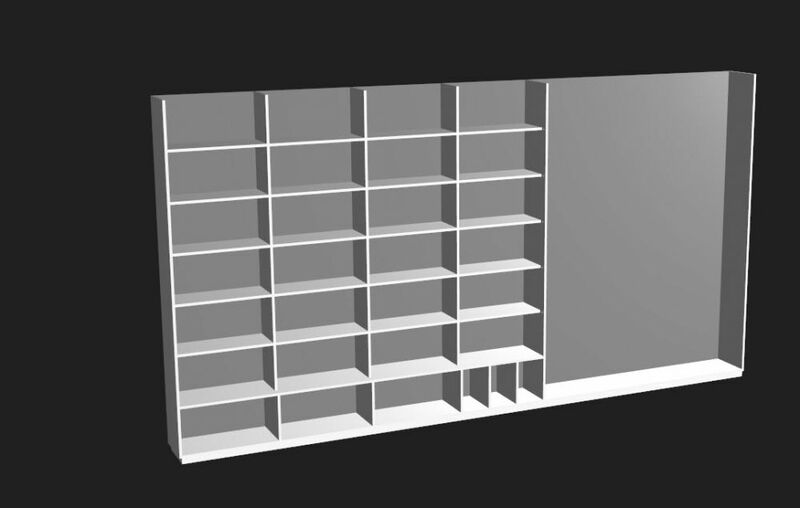 If you need more help designing this, I would suggest you buy CabinetFile, like that I can set up a few template models for you. Finally getting around to finishing my project. I realised I could have done things a little better, and want to empty a section of my cabinet and start again. I have deleted all the shelves and most of the uprights in about a 1/3 of a 5m wall unit, but there are 2 vertical divisions that if I delete either of them, the whole of the cabinet is emptied. Both divisions are full height top to bottom, and don’t have any shelves attached. I am assuming they are linked to teh rest of the cabinet somehow, but can’t work out how. It is the two highlighted divisions I am trying to delete.